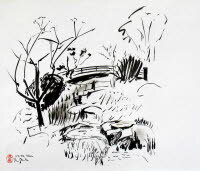 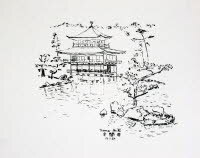 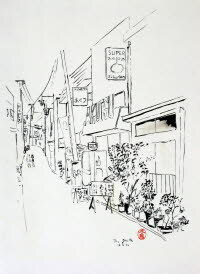 All drawings, done in Japan, were made with a black ink pen, commonly used in Japan for calligraphy. 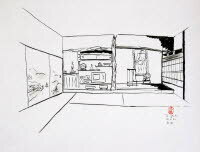 All drawings (but the last one) were made outside, directly in front of the object. 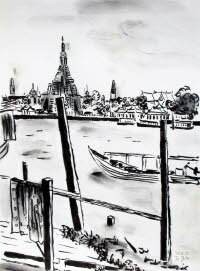 For example, the drawing in Bangkok was done whilst sitting in a simple, but very scenic restaurant directly at the Chao Phraya River. 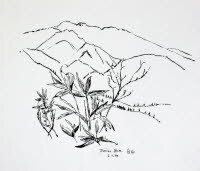 The Bodhisattva picture should be considered slightly apart. 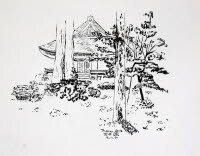 It was done during a Shakyoukai, a zen service conducted by a zen priest. 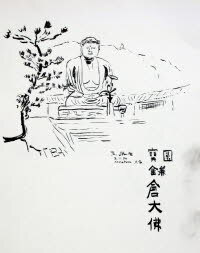 The Shakyoukai consists of a sermon and the meditative copying of a script that sometimes also contains an image like here of a Bodhisattva. 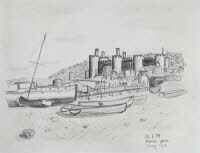 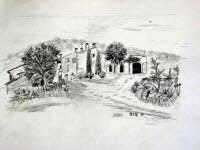 In this sense the drawing cannot be considered in the same sense as original as the other drawings, but it is interesting to look at nevertheless. 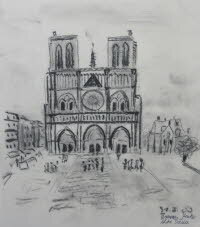 I also have a series of charcoal drawings of English cathedrals and castles, of Notre Dame in Paris and some other done early on (see early works). 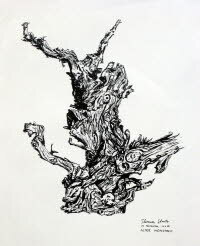 In particular I like the intensive study of an old root of a vine in France.